That is an important question for car owners. As we discuss the matter, keep in mind that one of the essential jobs of your tire tread is to move water. The channels in the tread act as passages for water to escape from underneath the tire. The deeper the tread depth, the deeper the channel – and the more water that can be evacuated. When enough water can’t be moved from underneath the tire, the tire can ride on the water – often called hydroplaning. The tire is literally not contacting the road but rather is “floating” on the water, so there is little traction and the truck or car can slide. So somewhere between a brand new tire and a bald tire lies the point at which the tire should be replaced. Some governmental jurisdictions have a minimum tire tread depth requirement for auto owners – others do not. So check the important laws where you live to learn the legal minimum. Tire manufacturers are required to mold a tread wear bar into the tire. This bar appears across the tread when the tire is worn down to 1.6mm ( 2/32 of an inch). Drivers can easily do the quarter test ( they used to use a penny, but I guess inflation has affected everything). Insert a quarter into one of the grooves with the caribou’s head pointing down. If you can see the tip of the nose of this great northern animal, it is a sign of very worn treads. That means it is high time to bid adieu to your tires. Studies have shown, however, that there is an essential difference in stopping distances for auto owners in detrimental wet conditions with tires that have less wear. For example, in controlled, wet conditions a vehicle with 3.18mm ( 4/32 of an inch) of tread traveling at expressway speeds was able to stop in about 85 feet ( 26 meters) less distance than the same car with tires with 1.6 mm ( 2/32 of an inch) of tread. That could easily be the difference between a safe stop and hitting the vehicle in front of you. 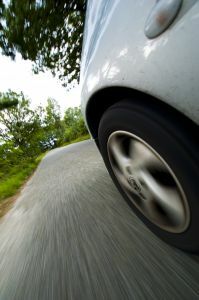 New tires are a big ticket item for motorists so it’s natural to want to get as much value out of them as possible. Just remember that a huge part of the value is the ability to stop safely in wet conditions. 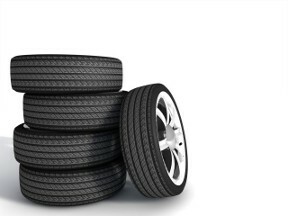 You can speak with your Express Car Care technician for answers about tire replacement.